Donan and all his fifty two monks were herded into the refectory and it was set on fire. St Donan is a saint, perhaps of Irish birth, who is associated with many places in Scotland. He probably lived around the time of St Columba, who foretold his martyrdom. Patrick Duffy tells his story. Donan was contemporary with or a little younger than St Columba. The presumption is that he was Irish, perhaps from the north-east coast of Dalriada and that he belonged to the Irish Picts. 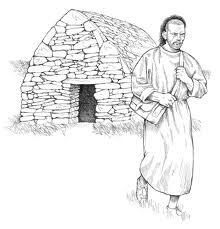 In early adulthood he crossed to Galloway and may have had some formation at Whithorn (Candida Casa) founded by St Ninian. A chain of Kildonans up the west coast of Scotland indicates the path he may have followed beginning with a Kildonan at Kirkmaiden in Galloway and a Chapel Donan at Kirkcolm, also in Galloway, a Kildonan on the Isle of Arran in Strathclyde and Kildonan on the island of Eigg in the Inner Hebrides. There are also Kildonans on the island of Little Bernera in the Outer Hebrides and in Sutherland in north-east Scotland. There is also an Eilean Donan near Dornie in Western Rossshire, just inland from the Isle of Skye, where there is a castle that is frequently photographed. The story of his martyrdom is linked to a raid by pirates or perhaps Viking raiders on his monastery on the island of Eigg during the Easter Vigil where Donan was the chief celebrant. It is possible that the raid was instigated by a woman of some importance who was angry that the monks kept sheep on the island and perhaps deprived her of her pasture rights. At any rate the raiders seemed to know in advance when all the community would be gathered together. They allowed Donan to complete the liturgy before herding him and all his fifty two monks into the refectory and setting it on fire. The massacre is recorded in the Martyrology of Tallaght, the Martyrology of Donegal, the Martyrology of Gorman and the Féilire of Oengus.